After this, it becomes Sampoorna Ganga. In a restaurant in Rudraprayag, I tasted this awesome Khichdi, immediately met the chef and asked him for the recipe, which he shared with me at once, without creating any fuss. And....what is my duty?? to share immediately with you all! The only modification I have done is, instead of basmati rice, I have used brown rice and have made it healthier. This Khichdi has been named Pancha prayag, (the chef told), because, 5 protein-rich dhals have been used in this,(which you may imagine to be the various great rivers) and the super-nutritious broken brown rice(which you may call the Sampoorna Ganga), has been combined with these dhals . And to augment the nutrition, amaranthus (called அரைக்கீரை in tamil) has been used. (there, the chef had used palak) What more you want??? Isn't it a great one-pot meal? Add the brown rice and dhals with the measured water. The brown rice + dhals came to 3/4 cups, for which I added 3 cups water, i.e., the ratio is one cup of dhal + rice :4 cups water. I would also like to mention one more thing here. 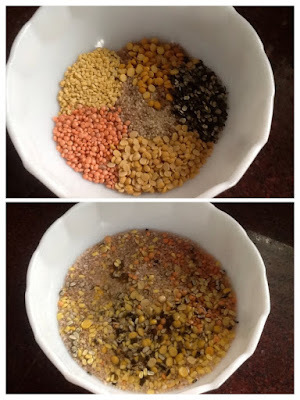 The split black urad dhal is a bit harder than the other dhals. 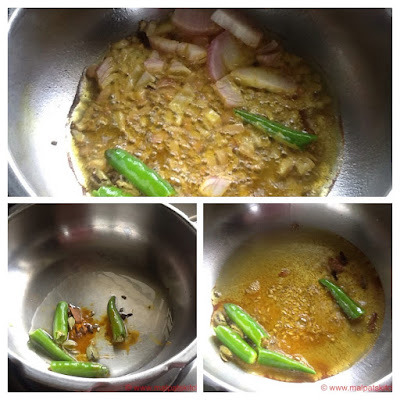 So, while the all the other dhals get a mashed up consistency, this dhal was a bit crunchy. But it was negligible tho. 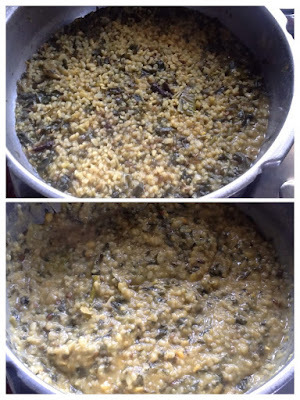 Picture below shows the khichdi cooked for 15 minutes, (after the first whistle, keep the flames on the lowest), and the second picture shows the nicely mashed up khichdi. Pour some hot water if necessary. 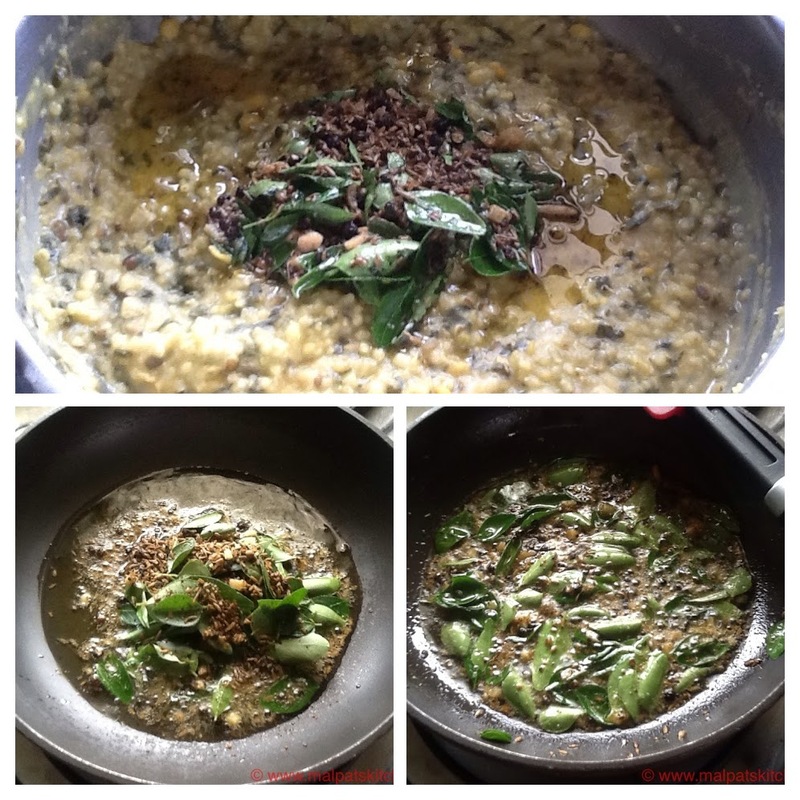 Final seasoning in ghee done with pepper-jeera, curry leaves and ginger, and added to the khichdi. The aroma will gently permeate all over the house, and your hunger will kick start. Serve it hot-hot, with a bowl of curds and roasted papad. (chef served it with fried papads)..... the only word will be YUM!!! *For an aching throat, nothing can give more solace. Like a small baby, gulping down the paruppu saadham (dhal-rice) with ghee, we gulped this wonderful khichdi down!! 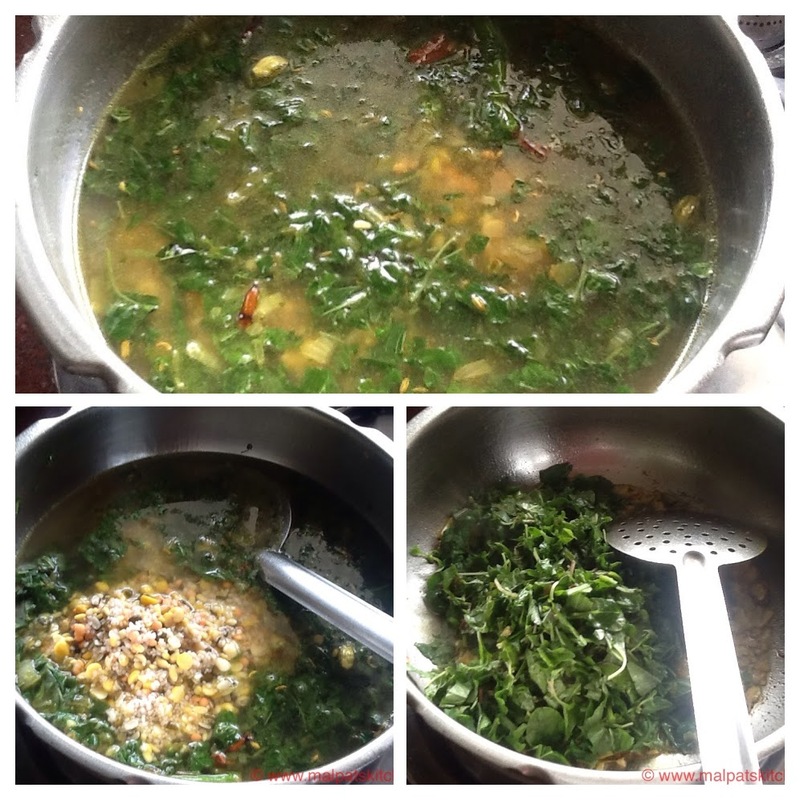 This wonderful satiating recipe from the neighborhood of Himalayas is endearing .Thanks for sharing this jam packed nutritive kichadi.The introduction to this recipe is fantastic! This is a sure pinup to my recipe index.